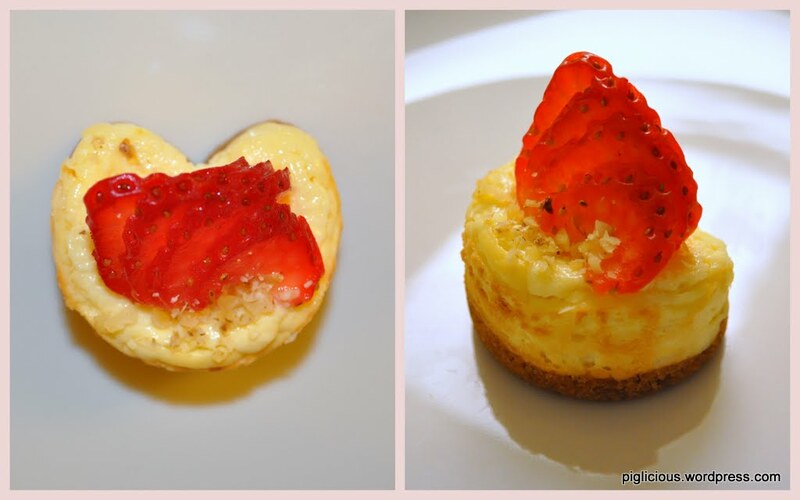 When I received my mini cheesecake pan , I made a batch of cheesecakes to test it out, and then I decided to get creative and tried making another batch of heart shaped ones! 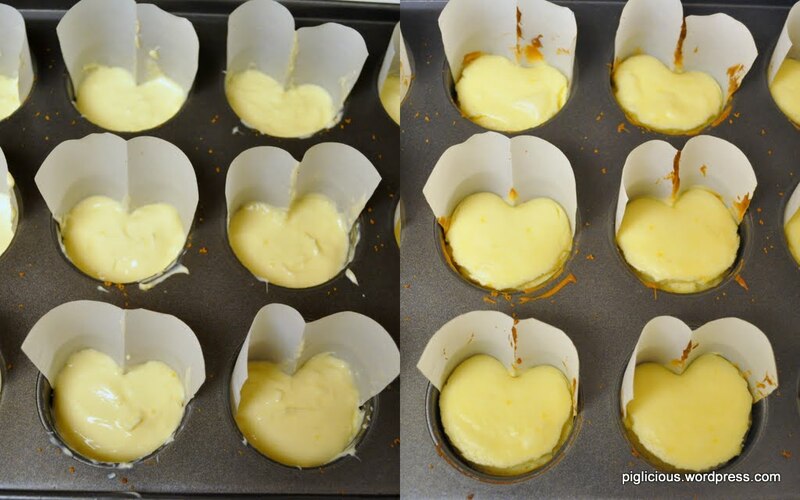 The pan’s individual cup size is actually quite small already, so the heart shaped ones were a bit difficult to make. Still, they were fun to make because of its cute shape. 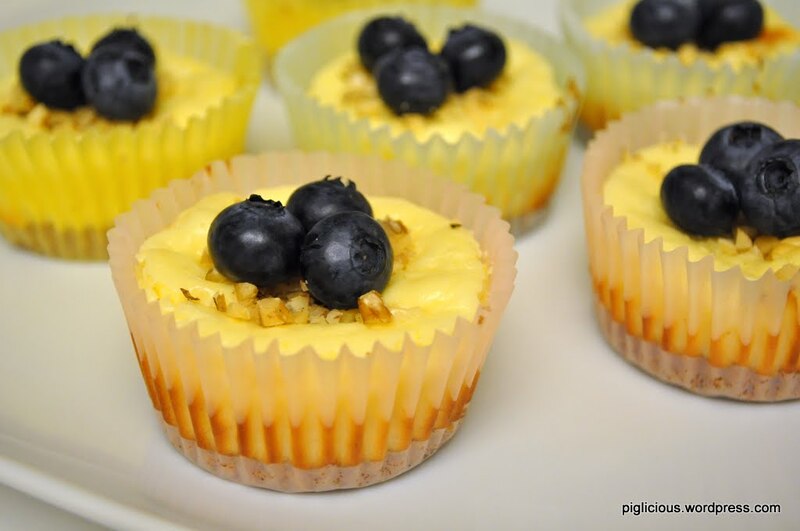 If you’d like to try a simpler version of this, try this other recipe out: mini cheesecakes. 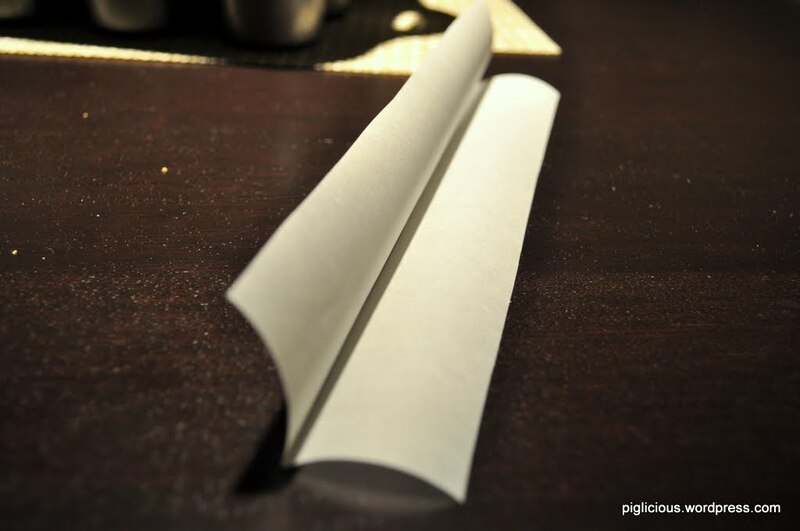 Cut 4 inch wide parchment paper. Fold in half. Cut 12 ~3 inches length-wise of the folded paper. 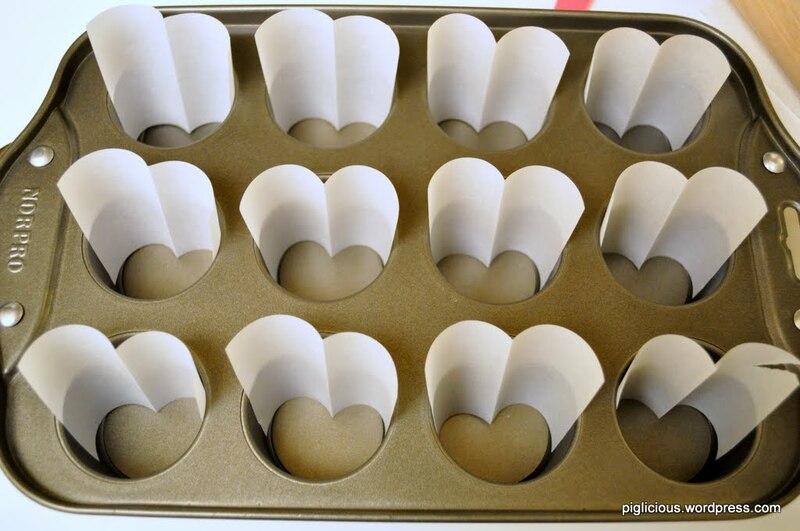 Place a parchment paper piece in each individual cup. 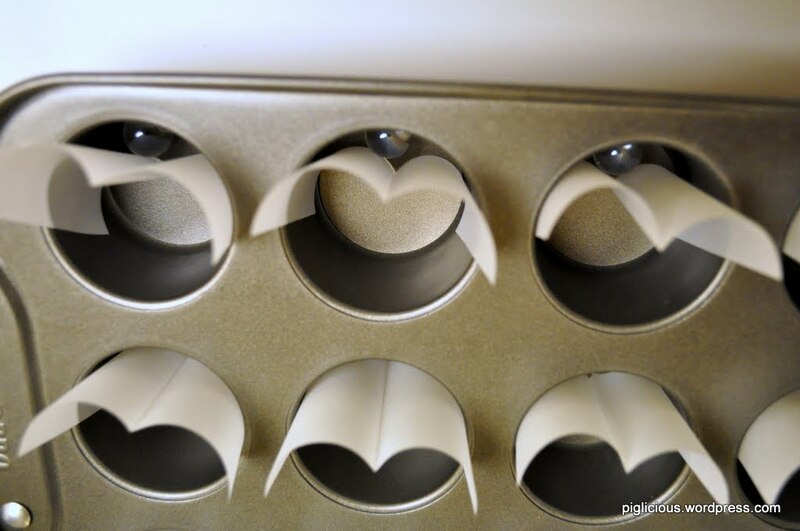 Place marbles in between the metal and parchment paper so that the paper is a little more stable. 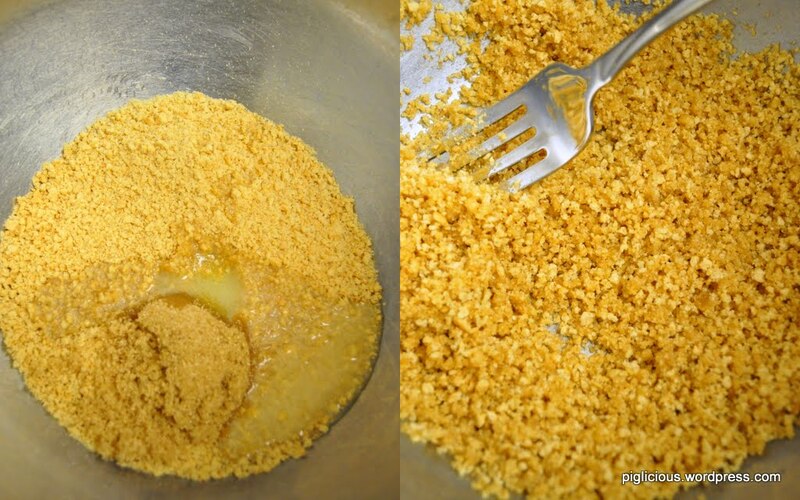 In a mixing bowl, first mix the graham crumbs and sugar well with a fork. 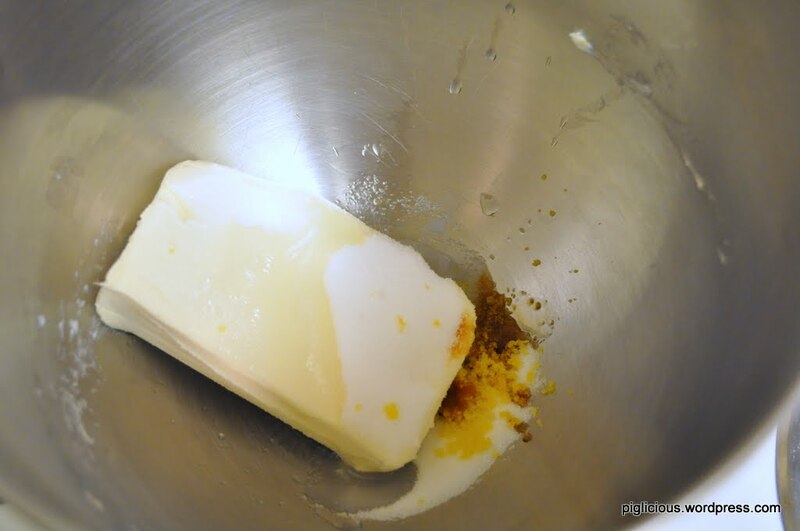 Then add the melted butter in and mix very thoroughly. Evenly distribute the mixture into each cup. 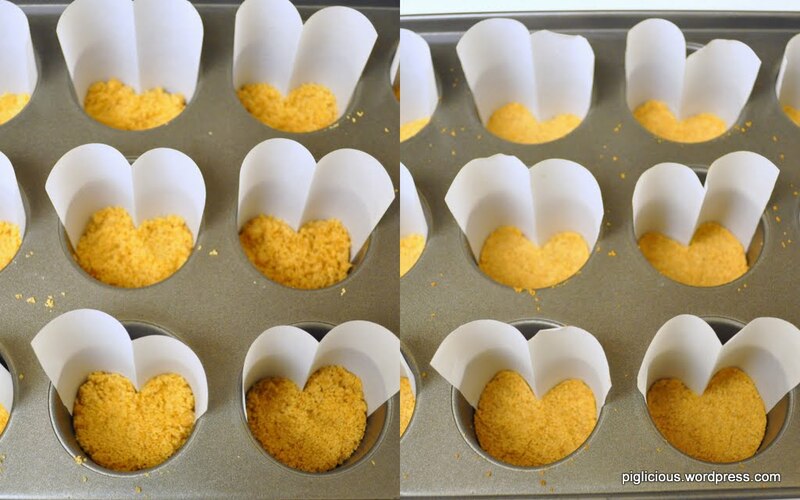 Press the graham crumbs down as firmly as you can. Bake in the preheated oven for 5 mins, then remove from oven and let it cool. Keep the oven on. 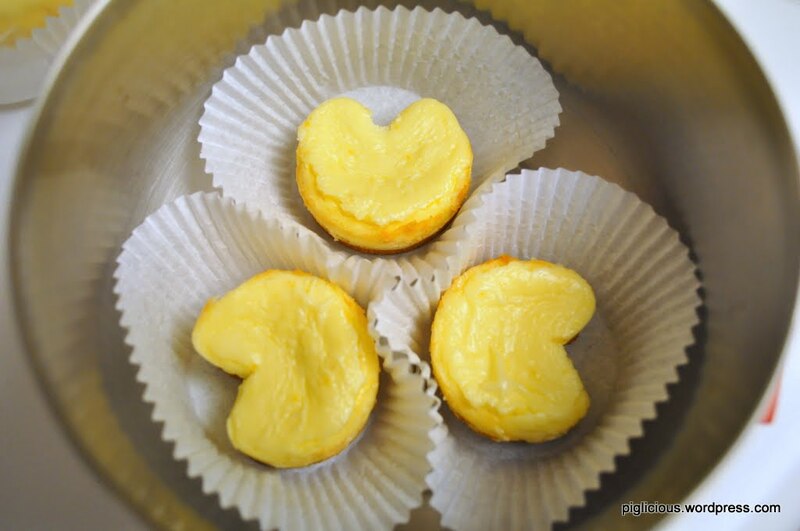 Beat together the cream cheese, sugar, lemon juice, lemon zest and vanilla on low speed (speed 1/2 with stand mixer) until fluffy. Be careful not to over-mix. Once it is mixed well, Add the egg in and mix on low speed (speed 1). It’ll look weird and gooey at first. But after a few minutes of mixing, it will become smooth. 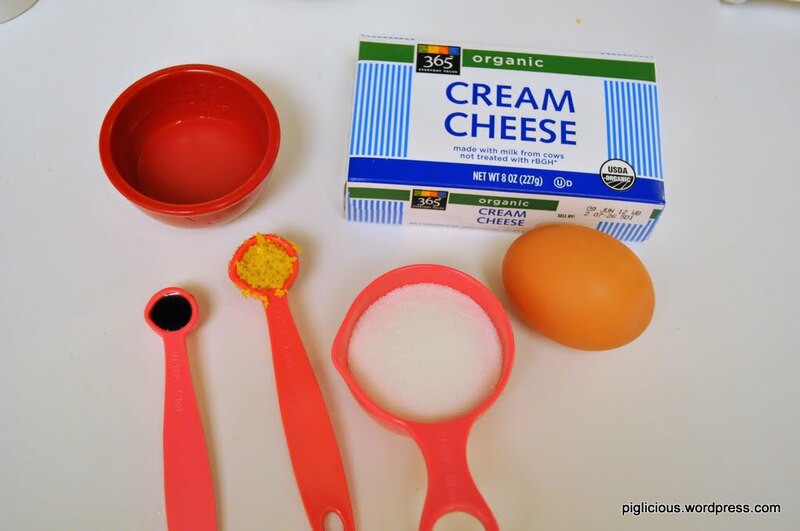 Use a spoon to place the cream cheese mixture into the cups. Smooth out the tops of mixture in the cups as much as you can. Bake for 17-19 minutes. Cool completely in pan before removing (about 1 hour). Then refrigerate for at least 1 hour before serving. Kind of looks like pac-man or fortune cookies. This was a fun little experiment. I noticed that it didn’t bake very evenly with the parchment paper/metal combination–the parchment paper section didn’t bake as much as the section that had contact with the metal. Although this happened, the cheesecake still tasted great. I topped them with sliced strawberries and chopped walnuts. 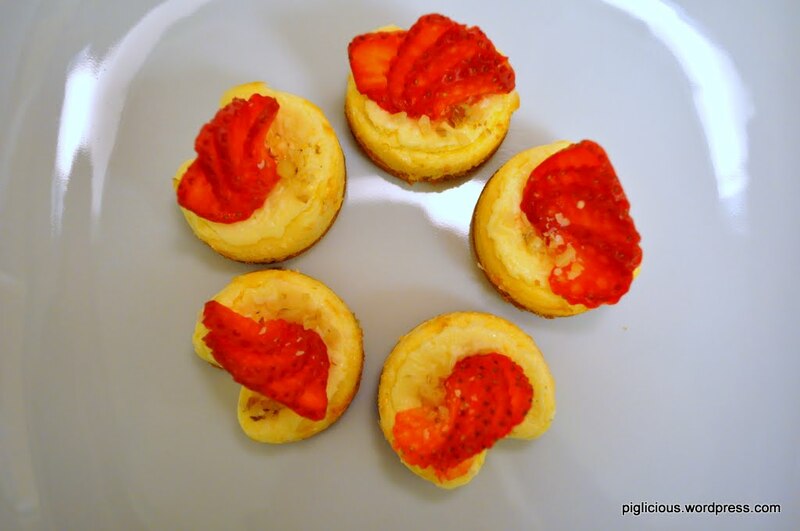 This was my first attempt ever for cheesecakes. And in preparation for more cheesecake making to come, I had just ordered a mini cheesecake pan on Amazon :D so excited. This recipe was pretty easy to follow, but I wished it had been a little more specific in some areas. 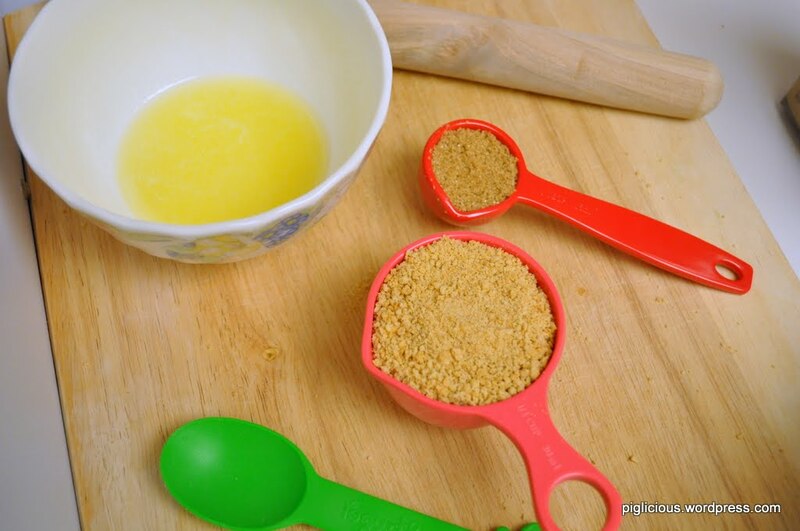 In a mixing bowl, first mix the graham crumbs and sugar well* with a fork. Then add the melted butter in and mix very thoroughly. 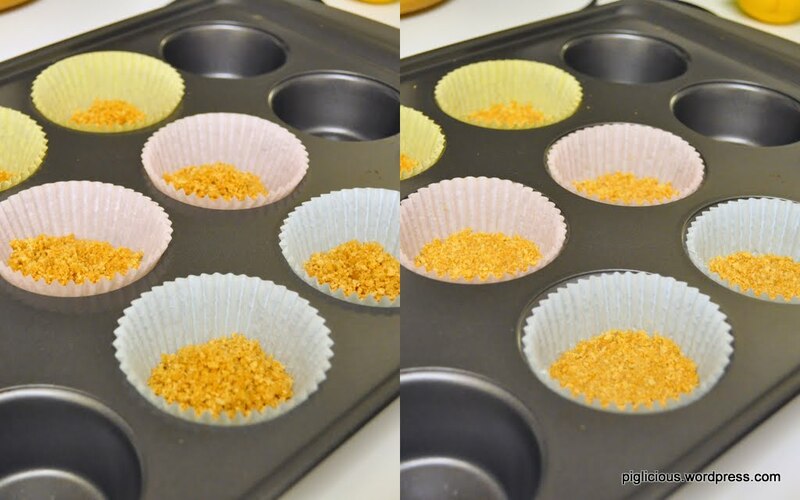 *I mixed everything together because the recipe didn’t specify, but I noticed that the sugar didn’t seem to be mixed evenly in the end, so mixing the crumbs and sugar first would minimize this problem. 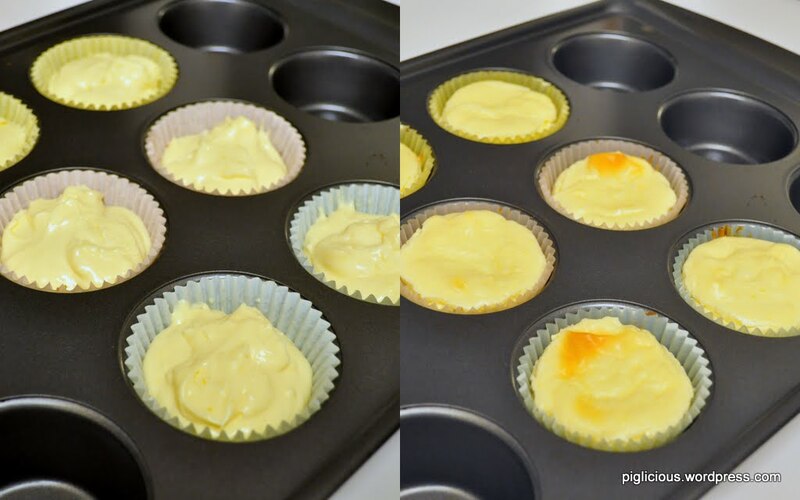 Measure a tablespoon of the mixture into the bottom of each baking/muffin cup. Evenly distribute the rest into the cups. Press the graham crumbs down as firmly as you can. Bake in the preheated oven for 5 mins, then remove from oven and let it cool. Keep the oven on. 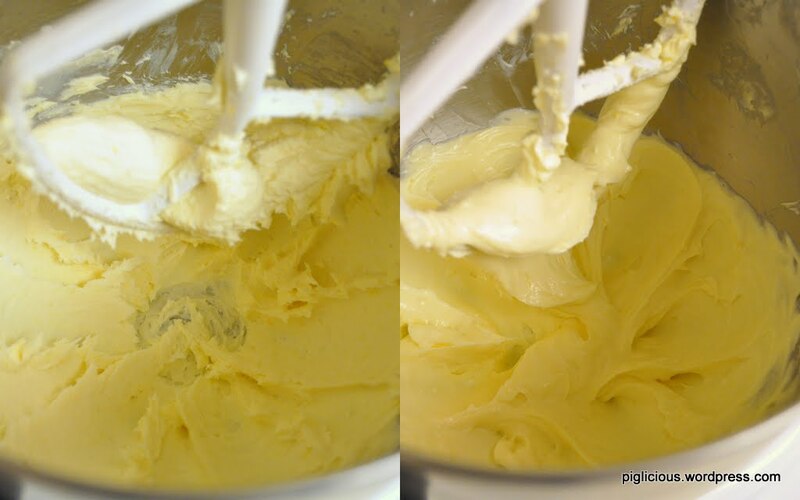 Beat together the cream cheese, sugar, lemon juice, lemon zest and vanilla on low speed (speed 1/2 with stand mixer) until fluffy (left picture). Be careful not to over-mix*. Add the egg in and mix on low speed (speed 1). It’ll look weird and gooey at first. But after a few minutes of mixing, it will look like the picture (on the right). 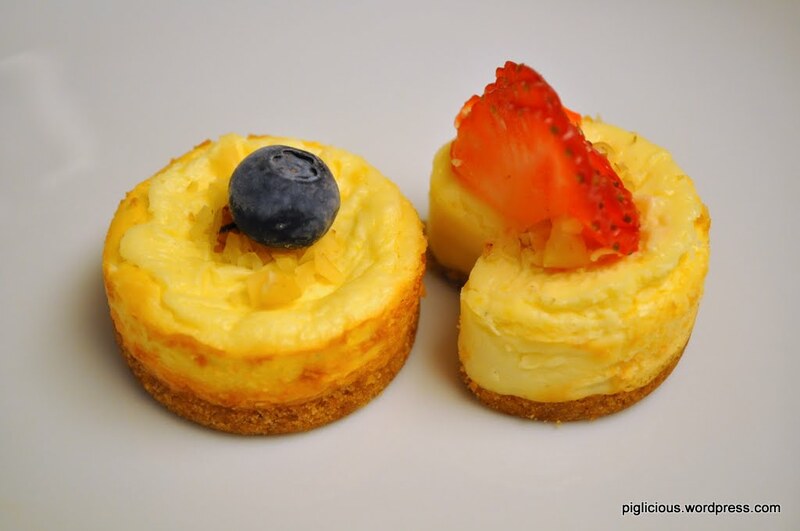 *Over-mixing may cause the cheesecake to rise like a souffle when baked. That’s what happened to mine. I did beat the ingredients together like crazy because that’s how I thought it was supposed to be done. 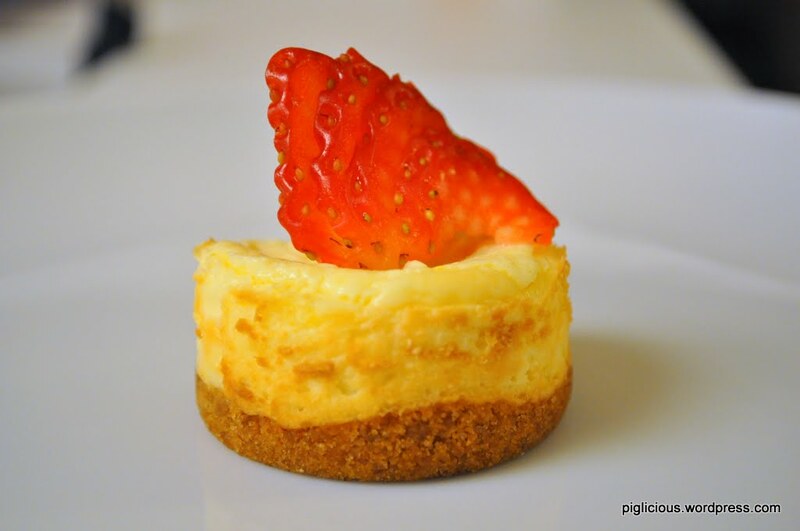 But afterwards I read on a few sites and it says that over-mixing incorporates additional air and tends to cause cracking on the surface of the cheesecake. 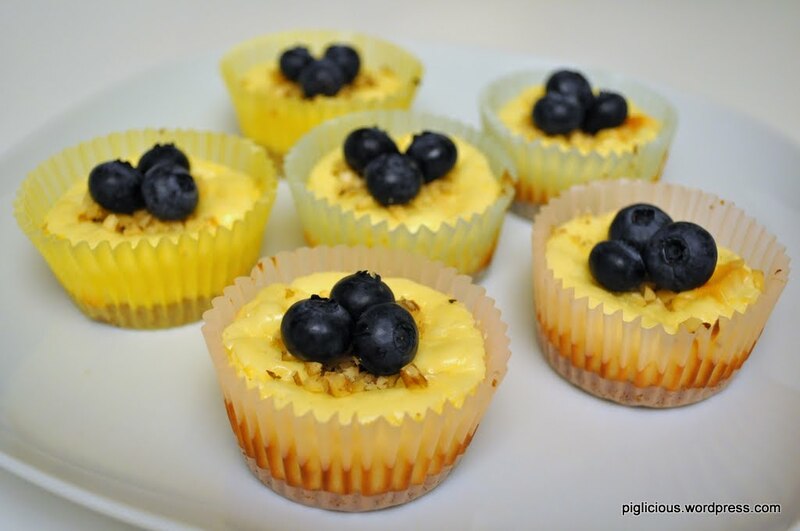 Use a spoon to place the cream cheese mixture into the muffin cups. Smooth out the tops of mixture in the cups as much as you can*. Bake for 25 minutes. Cool completely in pan before removing (about 1 hour). Then refrigerate until ready to serve. *I didn’t know that cheesecake mixture doesn’t settle that well and smooth itself out when baked, or else I would’ve smoothed it and would not have had a rumpley (and slightly overbaked) result. haha. Despite the over-mixing and slightly over-baking, it still tasted pretty good in my book.